Lady and the Blog → Deals and Steals → Extreme Couponing → CVS Weekly Score: Over $60 Worth Of Goods, Spent Under $3 + Received $11 In ERB: Here’s How! 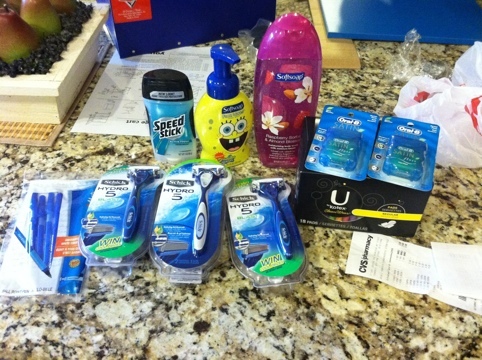 CVS Weekly Score: Over $60 Worth Of Goods, Spent Under $3 + Received $11 In ERB: Here’s How! I did a pretty good job this week, but it was only because I had $19 in ERB to play with yesterday morning at CVS. I did 2 transactions because I needed the ERB from this first one to pay for the second. OK I bought 3 Shick Hydro 5 razors. They were part of a “Spend $20 and get $10 in ERB” deal. Each razor was $7.99 BUT I had a $4 off, $3 off and a $3 off coupon so after my ERB from last week I ended up paying $2.04 out of pocket BUT got $10 in ERB for my next purchase. The coupons I used were from previous papers. I’m new to couponing, I wondered, how do you know ahead of time what the ERB will be? I seriously wish I had a CVS nearby! It would be SO nice to get those pricey things (esp razors) for a deal!